§ Matins. On the contrary, his modest proposal is common sense itself. When did people forget what a year is? Mr. Bondy’s vision is a spare one. The sets and costumes are stark. He applies violent and lewd touches. Tosca gashes the portrait of the Magdalene (with a breast bared) painted by her lover, Cavaradossi; Scarpia, the villain, clasps a statue of the Madonna in a sacrilegious embrace; and three lascivious women drape and fondle him in his study at the outset of Act II. Mr. Bondy said that his direction was rooted in the text. The tearing of the picture is a natural extension of Tosca’s jealous rants. Scarpia’s cry, “Tosca, you make me forget God!,” supports his Madonna hug. And Scarpia has clearly stated his fondness for the possession and disposal of women: hence the three female playthings at the opening of Act II, even though the libretto does not call for them. The director blamed a strain of hidebound traditionalism for the lusty boos. “Traditionalism”? The Zeffirelli production, which preceded Mr Bondy’s, was elephantine and no less distracting. We long for the days when opera companies can afford no more than a few rented costumes and painted scrims. Opera is music, folks! Visit Broadway for the kitschy spectacles. § Prime. This piece continues our exploration of the coming split in economics. Social econimists will evaluate individual economic decisions, and also do a better job than economists have in the past of measuring the moral implications of commercial transactions. Meanwhile, the quants, looking at things more statistically, can develop the ideas that Harvey Rubin discusses in New Scientist. First, though, we need to analyse finance as a hybrid system. I’m confident we can do that because of recent work showing that the tools we use to analyse such systems are applicable to biology. Two results in particular will resonate with the financial sector. One predicts which bacterial genes are essential and which can be knocked out without killing the organism. This is the bacterial version of asking “is this bank too big to fail; if I get rid of it, will the whole system crash?” The second models how flocks of birds or schools of fish perform collective tasks without centralised coordination. It is not a big stretch to propose that financial group behaviour, like panic selling, may be analysed using these tools. More complex questions about the growth of bacterial colonies can be answered if more complete information is known, such as the individual biological properties of each cell. Similarly, more complete information about financial institutions will allow more complex questions about financial systems to be answered. This proposal raises several practical questions. Will the relevant parties make the information available? Where should the information reside, who will have access to it and how will confidentiality be guaranteed? In conversations with financiers, I have found that there is an appetite for making the information available if confidentiality and anonymity are guaranteed. There is also acceptance that a government agency should be the repository of the information. All we need now is the political and corporate will to gather the information, engage the right team and apply these tools to help solve a really important problem. This passes our pie-in-the-sky test, but we’re going to have to lie down and contemplate that depository of financial information. The concert industry and health care are not so different. They are bloated systems that have found a way of delivering services in a way that would initially seem counter intuitive. The incentives could not be more backward .Profit motives hide behind high-minded rhetoric about delivering “art” and “health.” And, maybe most tellingly, many of those fed up with both systems blame the wrong parties. For health care, it’s illegal immigrants. For concerts, it’s Ticketmaster. I’m not a proponent of fussy food; I’ve never believed that you have to buy heirloom vegetables and organically raised meat to eat well. All you need to have is an interest in eating wholesome, what we used to call “natural,” food and an inclination to spend some time in the kitchen. The recipes I favor, the ones I go back to time and again, are simple, fast, foolproof, and taste good; the kinds of recipes that make cooking at home easy and pleasurable—the kind you’ll find on NoTakeOut. We’ve certainly liked the nottakeout recipes that we’ve tried. Sadly, though, our repertoire of quick dishes involve whole dairies of butter and cheese. 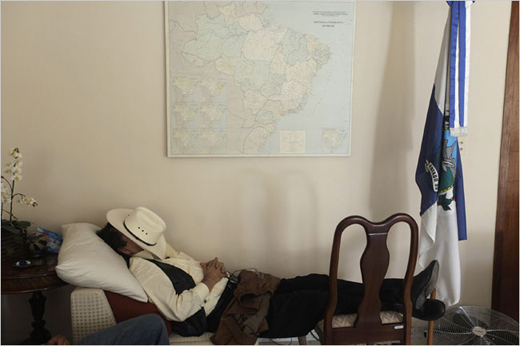 From inside the Brazilian Embassy, Mr. Zelaya described his return to reporters as an arduous 15-hour slog that required trekking through the mountains and navigating back roads in buses, cars and trucks to get around military checkpoints. He said he was helped by a Honduran citizen, whom he refused to name. How does “I mocked them” go, in operatic Italian? § Vespers. And she had the most interesting friends. Hughes liked her very much in return. ‘There’s something about her that’s kept very young,’ he wrote in a letter to his brother, ‘like a young woman. But everybody is so fond of her that she escapes the psychological isolation – for most old people inescapable.’ It would make a wonderful play, the friendship between the playful old lady and the mystical nature poet, but for the time being we’ll have to content ourselves with the account of their friendship secreted within the pages of Shawcross’s massive book. Noël Coward, not otherwise to be thought of in the same sentence as Ted Hughes, was also a chum. (The biography will come out here on 20 October). § Compline. Our thinking about “new ideas” has always run along these lines. Here’s a tentative model: Let’s say you’re listening to that catchy Wu-Tang song, with the chorus “And let’s start it like this, son, rollin’ with this one / And that one, pullin’ out gats for fun”. Once the acoustic snippet enters working memory, individual neurons in the prefrontal cortex will fire in response to the stimulus – they are the neural representation of the song. Here’s where things get interesting: even when the stimulus disappears – you’ve now started listening to a different song, perhaps that Boston song “Foreplay/Long Time” – those working memory cells continue to fire. They’re still holding on to the Wu-Tang clip, which is why working memory is a type of memory. This echo of activity only lasts for a few seconds, but it’s long enough so that our thoughts get blended together, as seemingly unrelated sensations overlap. (Scientists refer to this as RAM-like activity, since these brain cells are acting just like random access memory in a computer, which is rewritable temporary storage that allows multitasking.) The end result is that prefrontal neurons start to form connections that have never existed before. We can imagine how Wu-Tang and Boston might sound as a mash-up, if only because working memory allows the samples to intersect in the frontal cortex. From the perspective of the brain, such new ideas are merely old thoughts that occur at the exact same time. We used to call it “creative oblivion”: forgetting the part of an idea that you don’t need, and mis-remembering the useful part in connection with another idea altogether. This entry was posted on Thursday, September 24th, 2009 at 12:01 am and is filed under America the Frayed, Big Ideas, Diplomacy Today, Lively Arts, Markets, Money & Finance, Music, Noblesse Oblige, Reading Matter, Schools, Sovereignty, The Hours. You can follow any responses to this entry through the RSS 2.0 feed. Both comments and pings are currently closed. Lauds : The Times also added an article about booing, I guess because it is rare on opening nights of the season, when the House has traditionally entertained the swells. Mr.Bondy’s concept was muddled, to be sure. But rhose of us who have spent a few evenings at the Met would call it “classic” when compared to Sir Peter Hall’s Macbeth, which was the single worst production in modern Met history. Now that was a night for booing. Even the singers and Mr. Levine………..